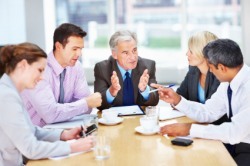 Company Partners Blog » Do Non-Executive Directors get paid? Non Executive Directors (NEDs) are a valuable asset to any growing company, but although they may be very experienced in their market area, for some it’s the first time that they have acted as a Non Executive Director of a business. The business also may be new to taking on an NED, so between them there is a lot of uncertainty of how the time and efforts of a Non Exec should be rewarded. In that we give an example of a real business (approx £1M T/O), which gave a 1 or 2 percent share of the business to each of two non-execs (the full-time directors/founders owned the rest), based on this they paid the non-execs a share dividend equating to about £400 a month. This paid for the non-execs time and ensured they had a keen interest in the company. For complete start-ups however, who may not even be paying the founders a wage, it can be difficult to get a Non Executive Director on-board, since there is no revenue yet to reimburse the NED for their time and expenses. This is where the young company has to make what they are doing interesting and show that there will be rapid growth, after which the Non-Exec would be able to be compensated. In the mean-time a small percentage of shares could be made available. It is best to first have a trial run of a couple months with each other to ensure a good fit. Also phase any share holding in over a period of time, making sure that the shares are recoverable should the NED leave. There are specialists who can help with drawing up share investing agreements. For the Non-Exec, working with a young company can be a fantastic experience, seeing it grow and feeling that you have helped to create something of real value. Being flexible in how you are rewarded will enable the growing company to afford your time. But to answer the original question, do Non Executive Directors get paid, yes mostly they do, how you arrange that can be agreed between you. Many NED are retired and/or financially independent and working for free or small equity to benefit from their experiance is a socially responsible thing to do, like volunteering and or giving to charities. As a NED and NE Chair of a number of SME’s including one start up, I completely agree that NED’s need to be both flexible and realistic in terms of their remuneration expectations. It will often mean that they are working for free or for very little until they prove themselves and their worth to the business. If they have the confidence that they can add real value then that should not prove a problem as long as an agreement is in place at the outset as to what fees will be incurred and when. Providing NED services to SME’s is very rewarding and to see a business grow and flourish partly as a result of your help and assistance is reward in itself.